This large residential project was designed in collaboration with Ireko, a Santa Rosa interior design and retail company, and is currently in progress. 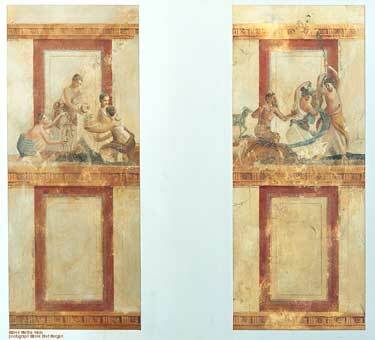 The design was inspired by old Roman frescoes, such as those found in ancient Pompeii. 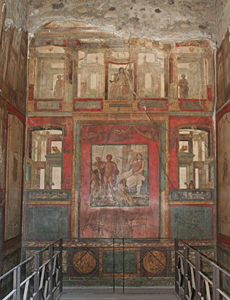 Research on the paintings of the period included a trip to southern Italy, to study in person the murals in the ruins of Pompeii, Herculaneum, and outlying villas. I was fortunate to have as guide my exceptional painting assistant, Filitsa Nicolaou, who lived and worked in the area for eighteen years and is fluent in Italian. On this trip we spent a week touring these stunning sites, that were buried – and beautifully preserved -- by the catastrophic eruption of Vesuvius in 79 AD. 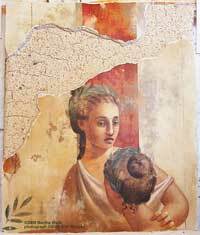 We were able to observe up close the artistic style of the period, and the natural effects of time and the elements on the fresco surfaces. Inspired by the extraordinary frescoes in these ruins and their beautifully weathered surfaces, I worked with Ireko and the client to create an original design unique to this residence. The finished murals will cover all four walls of a great room that is roughly 26' x 50', with a 22' ceiling. To the right is a scale maquette created for the client, which represents the panels on either side of one of the two floor-to-ceiling fireplaces. 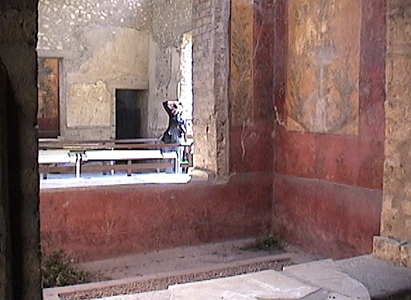 On the opposite, facing wall with the second fireplace, two additional panels have been designed with related narrative content. 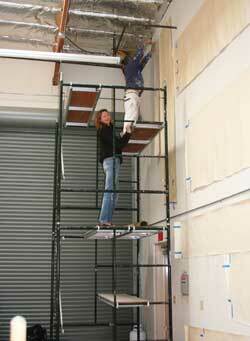 The finished panels in each of these four locations will measure 9'2” by 22' high (floor to ceiling). Here (left) I translated a small section of one of the maquettes into a 30” x 40” full scale sample image for the client. 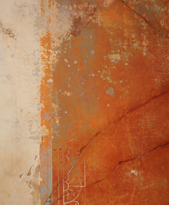 This sample also allowed me to coordinate surface details with the stone and plaster artisan working on the project. These maquettes (right) represent the two panels that will be fitted between floor-to-ceiling windows on the third wall, opposite the entry. 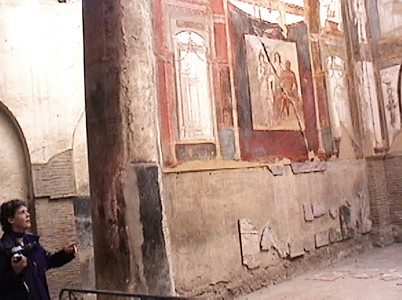 The fourth wall is also covered in murals, continuing the established style and narrative around the entire room. The preparation process has begun. The surfaces have been sealed, primed and layered w/ modeling paste and paint. 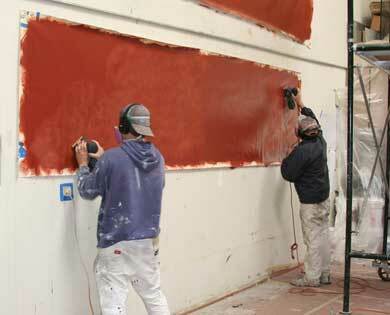 The surface is being sanded to expose the underlying coats of color, which add depth and a sense of age. To the left is one of the maquette images, now painted at full scale and ready for installation on the residence wall. 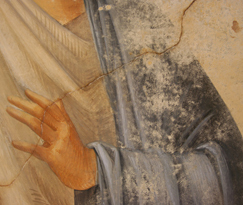 The detailed views below show how the finished mural effectively replicates the beautifully worn surfaces seen in ancient Italian frescoes.